On eBay, you are only as good as your feedback says you are. Your feedback is made up of comments — good, bad, or neutral — that people leave about you (and you leave about others). In effect, people are commenting on your overall professionalism. Even if you’re an eBay hobbyist with no thought of using it professionally, a little businesslike courtesy can ease your transactions with everyone. These comments are the basis for your eBay reputation. Because feedback is so important to your reputation on eBay, you don’t want others leaving feedback or making bad transactions under your name. The only way to ensure that this doesn’t happen is to keep your password a secret — always. If you suspect somebody may know your password, change it before that person has a chance to sign in as you and ruin your reputation. When you get your first feedback, the number that appears next to your User ID is your feedback rating, which follows you everywhere you go on eBay, even if you change your User ID or e-mail address. It sticks to you like glue. Click the number next to any User ID and get a complete look at the user’s feedback profile. The thinking behind the feedback concept is that you wouldn’t be caught dead in a store that has a lousy reputation, so why on earth would you want to do business on the Internet with someone who has a lousy reputation? You’re not required to leave feedback, but because it’s the benchmark by which all eBay users are judged, whether you’re buying or selling, you should always leave feedback comments. Get in the frame of mind that every time you complete a transaction — the minute the package arrives safely to your buyer (if you’re a seller) or an item you’ve bid on and won arrives — you should go to eBay and post your feedback. Every time you get a positive comment from a user who hasn’t commented on you before within the past week, you get a point. Every time you get a negative rating, this negative cancels out one of your positives. Neutral comments rate a 0 — they have no impact either way. 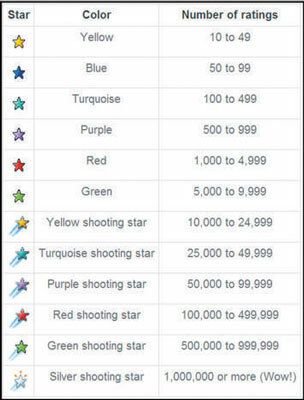 eBay even has what it calls the Star Chart, which rewards those with good-and-getting-higher feedback ratings. The flip side (or Dark Side for Star Wars fans) of the star system is negative numbers. Negative comments deduct from your total of positive comments, thereby lowering the number beside your User ID. You can sell one person 100 different items, but even if the buyer gives you a glowing review 100 times in the same week, your feedback rating doesn’t increase by 100. In this case, the other 99 feedback comments appear in your feedback profile, but your rating increases only by 1. Sellers are only allowed to leave positive feedback for buyers. You can leave a “positive,” but still be honest about your transaction in your words. eBay made this rule so sellers wouldn’t leave retaliatory feedback to buyers who left them negative feedback. Should a buyer who hasn’t paid leave you a negative, eBay cooperates and removes the feedback, provided you’ve filed an Unpaid Item report. If feedback is left individually and stretched out over several weeks (only one per week), the person on the other end of the transaction will get a single feedback point each time you leave a positive. Most buyers don’t seem to know this rule, though. Anyone with a –4 rating may have his or her eBay membership terminated. Remember, just because a user may have a 750 feedback rating, it doesn’t hurt to click the number after the name to double-check the person’s feedback page. Even if someone has a total of 1,000 feedback messages, 250 of them could be negative. Always note the feedback percentage. You can get to your personal feedback profile page right from your My eBay page by clicking the number next to your User ID. Positive feedback: Someone once said, “All you have is your reputation.” Reputation is what makes eBay function. If the transaction works well, you get positive feedback; whenever it’s warranted, you should give it right back. Negative feedback: If there’s a glitch (for instance, it takes six months to get your Charlie‘s Angels lunch box, or the seller substitutes a rusty Thermos for the one you bid on or you never get the item), you have the right — some would say obligation — to leave negative feedback. Neutral feedback: You can leave neutral feedback if you feel so-so about a specific transaction. It’s the middle-of-the-road comment. Say you bought an item that had a little more wear and tear on it than the seller indicated, but you still like it and want to keep it.